"I Found My Heart in Santa Fe" movie will showcase the beauty of Bantayan Island, Cebu in the municipality of Santa Fe. The idea and the birth of the film came from the director Bona Fajardo who discovered the beach by himself last year. And for the very first time, real-life couple Roxanne Barcelo and Will Devaughn join forces in terms of heart, talent and resources(as co-producers) to make what could be the most interesting and heart-warming romantic-comedy of the year. Will Devaughn plays the role of Viktor a handsome and charming German-Filipino in his late 20's. Being a nature loving adventurer, he manages his own company that deals with "Green Technology," focusing on the needs of developing countries. Viktor loves traveling and backpacking, preferring adventure and experience over luxury and comfort. Despite being well-off, he's humble and very simple. Practically good at everything, Viktor is athletic, intelligent and artistic. He practices martial arts, plays volleyball and the guitar/ukelele. Viktor, though, is in search of the mother he never knew and is very curious about his Filipino roots. His history and awkward family set-up has taught him to be more loving, caring and understanding of others. Roxanne Barcelo, on the other hand, plays as Jennifer a flamboyant, fierce and beautiful woman in her late 20's. A natural island beauty, she is easily desired by men. Not just good looking, she's also smart and hardworking. She manages a resort called Beach Placid that her family owns. As a resort owner, she is very hands-on and proactive. Despite living on an island, she's driven and does not indulge on "island Filipino time." Because of her recent heartache, she has become more reserved and doubting of others. She has episodes of bitterness and sadness that is understood by people who know her. Jennifer tries to avoid romance to save her from eventual pain but deep inside, all she wants is to be loved again. The beauty of the island is one of the main factors that moved the love story of Jennifer and Viktor, making Santa Fe as an important element that makes the movie interesting. The island, pristine and with raw beauty, serves as the perfect romantic backdrop. 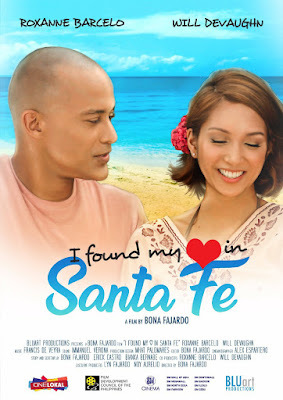 I Found My Heart in Santa Fe is the first brand new film to be screened at Cine Loka in select SM Cinemas beginning September 15.